1. The update is suspended for Mi Max 3 and Mi 4c due to system stability. 2. The update is suspended for Redmi Pro, Redmi Note 4, due to issue with restart in some cases. 3. The update is postponed for Redmi Note 5A/Prime, please stay tuned to latest info. 4. The update is suspended for Redmi Note 4X (SD) for camera issue. Rom: Mimax3 & Redmi6 Pro ? 2. The update is suspended for Redmi Pro, Redmi Note 4, Redmi Note 4X (MTK) due to issue with restart in some cases. 4. The update is suspended for Redmi Note 4X (SD), Redmi Note 5, Mi 6X, Redmi S2, Redmi 6A, Redmi 6 Pro, Mi Note 2, Mi Max 2, Mi Note 3 for camera issue. 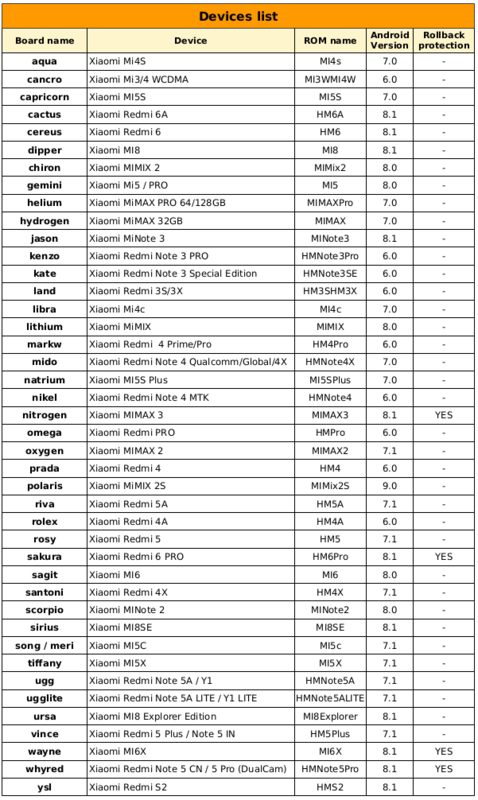 ROMs for Mi 4 and 4s are suspended too? Stability issues like on Mi 4c? Strange, the rom for Mi Note 3 is posted in the subforum http://en.miui.com/forum.php?mod=viewthread&tid=3571913&extra=page=1&mobile=2 but on main thread it says suspended - @ingbrzy ? Booting in system and immediately showed circle then reboot to twrp. Redmi5 why not on any list so? Redmi Note 3 Pro - works fine. Thank you team. I recommend.